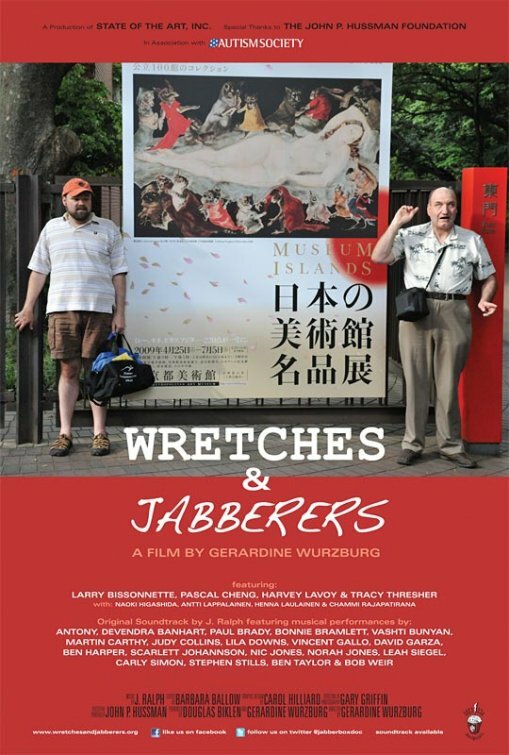 In Wretches and Jabberers, two men with autism embark on a global quest to change attitudes about disability and intelligence. Determined to put a new face on autism, Tracy Thresher, 42, and Larry Bissonnette, 52, travel to Sri Lanka, Japan and Finland. 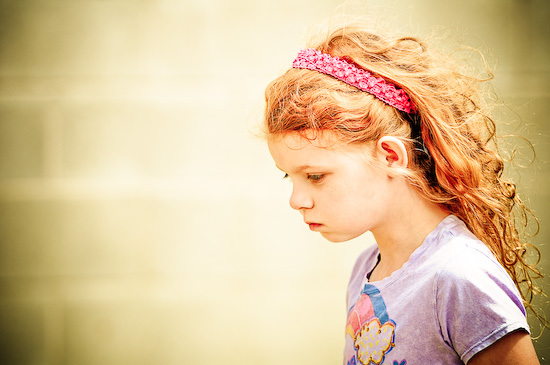 At each stop, they dissect public attitudes about autism and issue a hopeful challenge to reconsider competency and the future. Growing up, Thresher and Bissonnette were presumed “retarded” and excluded from normal schooling. 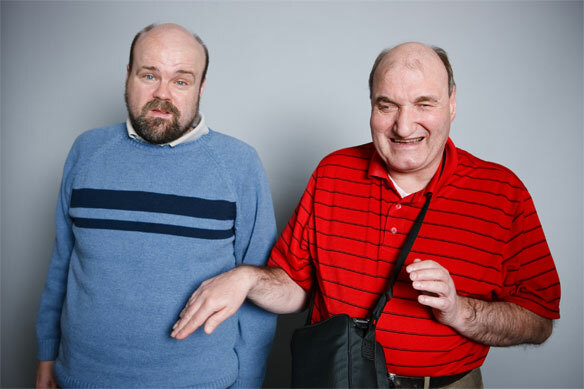 With limited speech, they both faced lives of social isolation in mental institutions or adult disability centers. When they learned as adults to communicate by typing, their lives changed dramatically. Their world tour message is that the same possibility exists for others like themselves. The website for the film is a goldmine of inspiration! I just couldn’t get enough of the extras on the site. There is some wonderful footage of Larry and Tracy as they screen the film for the first time and there are several videos of them touring different cities discussing the film. Another little goodie you’ll find are the fellow travelers, who are from various countries around the world. All are writers and advocates and all have found their voices by means of facilitated communication. Chammi from Sri Lanka, Naoki from Japan, Antti from Finland and Henna from Finland – their beautiful writings have touched me immensely. I want to post ALL of the videos and writing from the site – seriously! It’s people like Larry and Tracy who will make the future brighter for kids like Emma all over the world. I once described my longing to communicate with Emma like swimming to her across a great dark sea. It seemed like an impossible distance to cross, but I had to have faith that we could make that journey. I knew it had to be possible because I had seen Sue Rubin and Tito and others learn to communicate. They were carving the road for us. And now Larry and Tracy are taking this message across the globe. This is my passion, people! I want for an enlightened, educated and inspired future for my children and communication is the key. Emma has her voice now through typing and facilitated communication and the world has opened up to her in such a profound way. I think this excerpt from the site sums it up the best! …. Ultimately, Wretches & Jabberers is about the life-sustaining power of relationships – the personal connections that people make through communication. We can’t wait to see the film, guys!! FYI, the soundtrack is currently available on iTunes and is a collaboration of a long list of talent – everyone from Norah Jones to Ben Harper to Scarlett Johannson. 100% of the proceeds from the purchase of the album and its individual tracks will go to the Autism Society and the Wretches & Jabberers Fund of the Institute on Communication and Inclusion at Syracuse University. For a listing of AMC theaters across the country that will be showing the film, click here!!!! Wow! I feel your passion as I read this article. If I were making this film or having a part in it, I’d be beaming with excitement for the release date! Sabra, thank you for posting this! I am going to try to get a screening at CSUN via Family Focus. Oh, Vicki, that would be great! If you do, I’ll be there! Though I will NOT be wearing any make up to the screening… no point. I just cried it off watching the trailer.